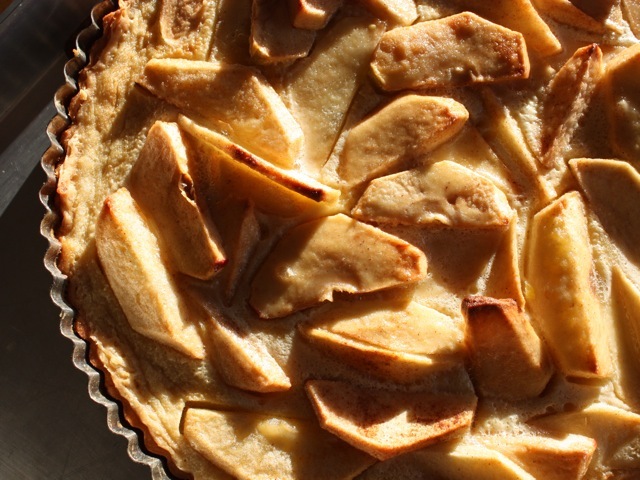 While this creamy apple tart may be eaten cold, it is best served hot or warm. It can be reheated. Toss the apples in a bowl with ⅓ cup sugar and the cinnamon, then arrange them in the pastry shell. Bake in the upper third of the preheated oven for about 20 minutes, or until they start to color and are almost tender. Remove from oven and let cool while preparing the custard. Beat the egg and remaining ⅓ cup sugar together in a mixing bowl until mixture is thick, pale yellow, and falls back on itself forming a slowly dissolving ribbon. Beat in the flour, then the cream, and finally the brandy. Pour the mixture over the apples. It should come almost to the top of the pastry shell. Return to oven for 10 minutes, or until cream begins to puff. Sprinkle heavily with powdered sugar and return to oven for 15 to 20 minutes more. Tart is done when top has browned and a needle or knife plunged into the custard comes out clean. Slide tart onto a rack or serving dish, and keep warm until ready to serve. Culinate editor's note: This tart is perfectly sweet without the powdered sugar.